Increase the number of repeat sales with follow up emails on different events. Build a strong customer loyalty by establishing lifetime relationships with your customers. Create new customer segments and edit already existing ones. One of the most efficient ways to increase sales productivity is to continue selling to existing customers via follow up emails. It takes far less energy, money and time to retain current customers than to attract new ones. Create consistent productive relationship with your customers using Follow Up Email for Magento and enjoy higher conversion rates and a higher percentage of referrals. Start winning more sales today by implementing your own follow-up marketing system! When you specifically know what your potential customers want, you are able to prepare customized offers for them that would address their needs and get rid of their hesitations. By the use of Follow Up Email Magento extension, you can create special promotion emails based on the products added to wishlist. The extension enables you to send win-back messages with exclusive offers to customers who have not logged in your store for some time. The potential buyers will certainly appreciate the extra attention and maybe it is just the thing that will drive him to place an order. Greet your customers on their birthdays via Follow Up Email extension. Give them exclusively designed heart-warming greeting cards and coupons and you will definitely win their hearts! NEW: Now you can congratulate your customers in advance by sending them a greeting email before the actual birthday's date. Send welcome nurturing follow up emails to new subscribers. Encourage them to make an order by offering a discount coupon. Since you have shown to customers the interest in helping them and gave them what they want, the customers are more willing to consider your product or service offers. With the Follow Up Emails tool you can suggest them related, up-sell or bestselling products which they probably need. This module allows fully automatic dispatch of review reminder emails some days after order placement. Establish close relationships with your customers and increase your store credibility. Inform your clients that their customer group has been recently changed and now they have special privileges on shopping in your store, for example, they were moved to loyal customers group and can purchase any items with a 5% discount. Create flexible rules for different events according to your business goals. 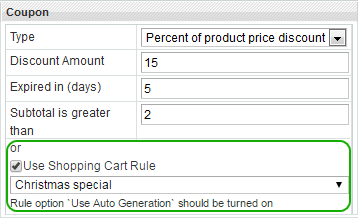 You can set conditions for store name, product SKU, type and category, cart amount, number of orders and customer groups. You can apply Enable, Disable or Delete actions to any number of email sending rules from the grid. This option can save you a lot of time during email marketing campaign. Follow Up Email Magento extension enables fully automatic letter generation and dispatch that, of course, saves much of your time and energy for other business tasks. The module enables you to plan ahead your marketing campaigns and schedule the time of automatic email dispatch. With the extension, it is possible to select the event, which cancels the email dispatch. It will help you to avoid e-mails that are no longer active. - Use shopping cart rule messages in your emails. This feature adds flexibility to promo campaigns based on coupons. Follow Up Email for Magento supports transaction email templates which you can customize for higher marketing efficiency changing content and CSS as you need. Holidays are always a busy time. Shop owners need to do many things to make shopping pleasant for customers and profitable for business. With the new starting event the module helps you to take care of emails in advance. You only need to choose the date and create a suitable rule. It’s just as simple, as it sounds! Use format manager to display currency, dates, price and time in the necessary format. Use URL manager to automatically create URLs corresponding to Magento requirements. Create a black list to avoid sending emails to unsubscribed or unwanted customers. If you continue to bother unsubscribed clients with new emails you might lose them forever. Moreover, users can add your emails to spam list, which will badly affect your reputation scored by email service. You can easily preview email templates and send a test email to the appropriate email address to make sure everything is alright. You can set up the required email sender name (for example marketing department, support service, etc. ), the appropriate sender address and email for getting copies. Show that you value your clients' time and trust, so all emails from your store have valuable information. Now when a customer adds several products to the wishlist, only one email notification will be sent. To take the coupon usage over total control make the promo-code sent in the follow up email valid only for the email addressee. If you don’t want to build a displeased audience, you should allow your clients to unsubscribe from getting your emails. You can easily do this just placing the unsubscribe link in the footer of your email. What more do you need for well-run email marketing campaigns? When following up with customers, it is important not to bombard them with sales promotions. This aggressive way may put some people off. With the help of Follow Up Email for Magento you can keep a track of follow-up emails through email log and monitor the frequency of email delivery. Also you can edit or delete the email templates right from the queue grid. Follow Up Email Magento extension enables you to analyze the effectiveness of your email marketing campaigns. You can specify the Google Analytics tracking code and monitor the number of clicks in emailing and get the marketing data of email campaigns. Easily add free products to follow up emails with the help of Auto Add Promo Items extension. Encourage your customers to share their experience in reviews. Explore the Smart Review Reminder extension to easily collect product reviews and build a strong relationship with customers. With rich functionality of Advanced Customer Segments module you can classify all clients by many parameters and make your email promotions even more effective! Acquire more sales through reliable delivery. Make sure your marketing correspondence gets delivered to customers with Magento SMTP Setup. Scheduled emails are not being sent out. What should I check first? There are several tips you are advised to pay attention to while checking why emails are not being sent to your customers. Please click 'Read FULL answer' link below to see the possible root causes. Are there any ready email templates? Yes, our Follow Up Email extension includes the email templates for your convenience, so you can start using them at once. Can email templates be customized? Yes, sure. You can either customize the existing mail templates or create new ones according to your needs. Continue reading to learn how to make it. How is birthday info captured? The module triggers email greetings by birthday data available in customers’ accounts. Do these follow up emails work for guest users? Yes, they do. Note that only order-related alerts can be sent to guest users. Wishlist and Birthday follow up emails won’t be sent since they require information from a customer’s account. Are there any Customer segmentation possibilities? Yes, we are happy to confirm that this Follow Up Email module has a customer segmentation option built-in. Address our blog post and go on readint to see more details. Can I change sender details on an email campaign level? Yes, it is possible. For this, you need to make changes in the default email details. Go on reading to see the settings. Can I track my follow up email campaigns via Google Analytics? Yes, with the use of an appropriate tab 'Google Ananlytics', you can track follow up email campaigns. Continue reading to see the settings. Русскоговорящий саппорт - отличные ребята. Была приятно удивлена качеством и скоростью саппорта, не характерно для нас. На все вопросы отвечали терпеливо и быстро. В модуле черт ногу сломит, но все объяснили и помогли настроить. When we decided to purchase the follow up addon, we'd already installed the abandoned cart by this developer. Both these tools work nice and helped us launch sustainable emails dispatch. Didn't work out of the box. And they also could include more followup types for this price. Good program, works with my magento 1.9.1 version. All email types run the way I expected. Very reliable vendor! We’ve just installed the app (as soon as we noticed that they inc luded segmentation features). You know, it’s really handy to keep segmented customer database at hand and use it for targeted emails. It also allows sending much more email types than described. However, we haven’t tried different follow ups yet - only review reminders. Were a bit nervous before triggering the campaign, luckily everything went without any pitfalls. Hope, we won’t face any unpleasant failures in future as well. The app is absolutely gorgeous! This is our first app from amasty and it didn't let us down. I want to thank the support guys who fixed all our issues in about a day after the ticket was submitted. The app itself works fine, we easily set up necessary emails and customized the templates. Thank you, guys! nice extension, no bugs spotted, our developer said the code is clean. We noticed a small tweak – we couldn’t send emails afte r 1 month, only before that date. We contacted support, and they promised to extend this feature and update the extension in a couple of days. Support is fast (1-5 hours to reply) and kind. The main reasons we chose this extension were: we can use small icons near custom statuses (we used green, yellow, and red dots), display statuses in the shopping cart, and, the most important, attach statuses to quantity. All these features are great for creating urgency during holiday sales, as we had troubles when customers ordered a great deal of products and we couldn’t deliver because they came out of stock. The only thing that came complicated to our managers is that you have to be very accurate with setting those statuses, lots of settings and dropdowns and rules can be tricky. The thing I like most about this extension is the ability to send follow up emails based on previous orders. We used to send more general offers before and they didn’t work well. I also like reviews follow-up. Of course, not all of them reach customers and not all the emails get customers to write reviews but still 2 wins out of 10 tries is a good result here. I can’t say anything specific about the code as I’m not a developer. As a user I didn’t faced any problems with the module, I just needed some customization and Amasty helped me with that. It's a complicated module and I needed help to set everything up as well as add cron tasks (not a developer or engineer of any sort). But this module has lots of features and it's really cheap if to compare what it does. For us (custom crafted jewelery) review reminders worked the best way - we've got feedback from lots of customers. Could have been more beautiful templates though. I am very satisfied with the product. We use almost all the types of emails it provides us with and starting from the first day of usage we have increased email traffic and conversions. No bugs - I was happy with it because I tested two extensions from other Magento extensions providers and their email solutions weren't even close, also giving me errors and incorrect behavior (which is awful, I can't understand how they can send a product that's not working) and finally I asked for a refund. This extension works well and has lots of settings I need. we sell fitness supplements so basically people order them not once, thus we send a coupon after every more than $50 order and people do return, as they need the product again and they have a discount. Great work Amasty, I even don't regret the time I spent to write this review. – Fix: issue with cross-sell products was fixed. – Fix: link to the FAQ article was updated. – Possibility to enable the coupon only for the email recipient. It's optional and set to 'No' by default. – Possibility to use URL manager for the email templates to automatically create correct Magento URLs. – Admin can use format manager for the email templates to display data like date or price in the necessary format. – Internal changes to provide customer segmentation support in the next version.